Fiorina, who showed up right on time, which is always a nice sign of respect to ones audience, is shorter than I had thought she would be. She’s such a trim, upright, tidy figure that I somehow had the impression that she’s a very tall woman. She’s not; she just has a tall presence. Unsurprisingly, Carly attacked Boxer vigorously, castigating Boxer for being totally invested in big government and big spending (except, of course, when it comes to our military). She also pointed out, as she has before, that Boxer, while a reliable vote for any liberal cause, has been an ineffectual Senator. In Boxer’s twenty-eight years in Congress, she has succeeded in getting her name on only four bills, three of which were non-substantive bills (naming rivers and buildings). 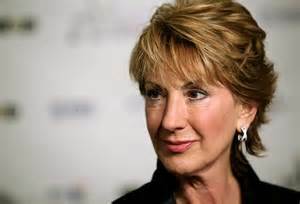 Indeed, said Fiorina, Boxer is so ineffectual Democrats had to take Cap-and-Trade away from her, even though it was supposed to be her baby — apparently, no one likes to work with her. Fiorina steered away from giving specifics of what she’ll do when (if) she gets to D.C. This was a wise move because, as a junior Senator, she will have somewhat limited power, given the Senate’s byzantine hierarchy — although Fiorina did joke that, as a medieval history major, she may be just the person to deal with that labyrinth. In any event, it remains to be seen what the Senate’s composition will be, something that will affect Fiorina’s ability to put her beliefs and ideas into effect, at least in the short term. Instead of nailing herself to impossible specifics, Carly focused on her philosophy of government and governing: small government; states’ rights; accountability and daylight for all government agency spending; support for the military; support for small businesses and all businesses; world economic leadership, in all new fields (biotech, infotech, energy tech, etc. ); the overturn of the congressionally-created Dust Bowl in California’s Central Valley, once the farming capital of America; and wise environmental stewardship that recognizes the need to develop clean new energies, including nuclear, even while taking advantage, in a environmentally-friendly way, of traditional energy (i.e., oil). During question time, the two questions I found most interesting were these: How will Carly counter the strongest attacks made against her, namely her support for Prop. 23 and her decision to fire HP workers; and how will she shrink government, since government has a natural tendency to make itself grow. Carly answered the question about Prop. 23 by saying that the United States needs a reasonable, coherent, straightforward national energy policy, that nevertheless respects states’ rights. The U.S. must also be an energy leader, if it is to maintain its position in the world, one that allows it to export its unique respect for freedom and social mobility. Being an energy leader involves, as I mentioned above, environmentally sound development and use of all available energy sources. As for having fired the HP workers, Carly said that sometimes, as a leader, you have to make tough choices. There was a high tech recession then, and she had the choice of cutting some positions, or letting HP go entirely. When she got HP back on track, she doubled its size and hired large numbers of workers. Those are the choices government management has to make too. (And let me add here my own opinion that one of the most outrageous things about the Democrats’ insistence that they must raise taxes on the employers and wealth-creators of America is so that Democrats can continue to fund our currently bloated government. It doesn’t seem to occur to the yahoos in D.C. that they should trim government radically.) Carly lucidly ran through the numbers about the way in which government has grown even as the private sector has deflated during the recession, not to mention the fact that struggling Americans are providing the government workers with a much higher standard of living than average Americans enjoy.